Lake Taupo is a spectacular lake, pretty much dead centre of New Zealand’s North Island. It’s a well established trout fishing, sailing and cycling destination, but Taupo, on its shores, is fast becoming a popular resort town for those who like their relaxation mixed in with a bit of adrenalin pumping adventuring. Some of the best places to stay on Lake Taupo are the quiet, old fishing lodges, but there are also various newer hotels springing up too if you prefer things more modern. Lake Taupo is actually a flooded volcanic caldera - for one of the world’s largest super-volcanoes. So it’s incredibly deep, and freezing cold, except for the few places where there are thermal springs coming up just by the shores. Hot Water Beach, Acacia Bay and Whakaipo Bay are good spots for bathers, and you can actually swim right by Taupo. But if you’re boating, then the vast expanse of the lake and its numerous beautiful bays, beaches and coves, are your oyster. There are plenty of different ways to enjoy the lake’s beauty, ranging from relaxing strolls along the shoreline, taking in the spectacular views, which on a clear day reach all the way to the snowy peaks of the Tongariro National Park, to jet skiing on the lake or rafting on the rapid-y Waikato River. Lake Taupo also has a number of hot springs and thermal health spas around its shores, and just outside of Taupo you’ll find the dramatic splash and swirl that is Huka Falls. Taupo also has a motorsport park, which has staged the A1 Grand Prix, and which you can now have a go on, as well as a great little museum with an excellent Maori gallery. Just beyond the lake, but still on its geothermal field, you’ll find the magical Craters of the Moon, a collection of steaming volcanic craters stained with sulphur and other colourful minerals, making them a sort of otherworldly experience. Every now and then the build up of steam, heat and pressure under the ground reaches a point where there's a huge explosion of mud, and another blowhole and mud pool is born – some are up to 20 metres deep. Hike around the stunning Huka Falls and marvel at the breathtaking scenery. Take a boat ride to see the beautiful Maori rock carvings, as well as learning about the history behind them. For something more action-packed, go white-water rafting down the Aratiatia Rapids. If you fancy taking a break from all that exercise, then spend the day relaxing in the hot pools at the Spa Thermal Park. Taupo Museum is a great spot for those wanting to find out more about the area's past, filled with a lovely array of artefacts specialising in Maori culture. Don't forget to plan ahead if you want to book one of the best places to stay in Lake Taupo during New Zealand's summer months - it's a popular spot. The Acacia Cliffs Lodge is a four room lodge set right on the Acacia cliffs, offering spectacular lake views. The rooms are neutral and modern, with floor to ceiling windows, and private terraces, to make the most of the view. You’re surrounded by two hectares worth of private garden. 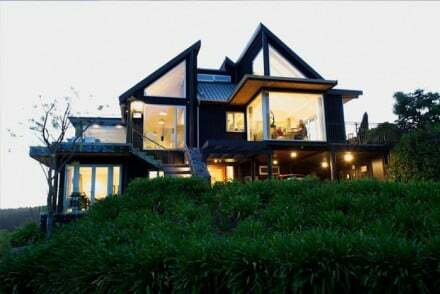 Lake Taupo Lodge is also set very close to the lake, in three and a half acres of its own bushland. The six rooms are bright, comfortable and elegant with spa baths and private patios with lake views. 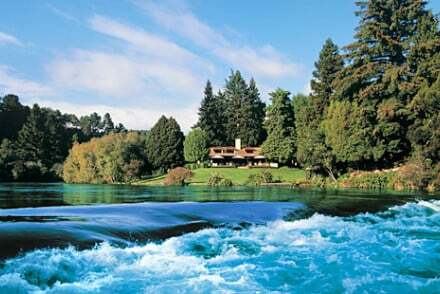 Huka Lodge is a charming 1920s built fishing lodge, just downstream of Lake Taupo, but right on the river. The lodge itself has been converted into a luxurious hotel, but there are also a rage of suites and self-catering cottages in the 17 acres of garden. The decor and details are all indulgent, but you’re in the perfect spot for some adventuring. Lake Taupo is obviously nicest during the summer months, from November to February, with the temperature climbing to the mid-20s on certain days. However, this is also when it's busiest so if you want to avoid fellow tourists then consider coming in autumn - when the weather's still perfectly pleasant and the natural surroundings are a variety of lovely colours. Visitors can fly into Taupo Airport, served daily by direct flights from Auckland Airport. Or, you could take the InterCity bus from Auckland, Hamilton or Wellington to Lake Taupo. From the airport, a shuttle meets every scheduled flight and provides passengers with a door to door service! 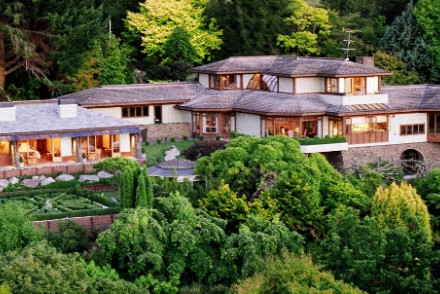 Browse through our list of all the best places to stay on Lake Taupo. Expand your search and look at all our North Island recommendations.